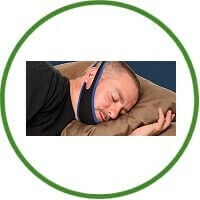 However, there is a very effective way to stop snoring and that is using the Stop Snoring Jaw Strap. How it works? Snoring research has shown that a jaw supporter, keeping the lower jaw in an upward position increases the three dimensional space in the airway, reduces air velocity and soft tissue vibration. This action can eliminate or substantially reduce snoring! The stop snoring jaw strap helps to keep your jaw and mouth closed while you sleep and encourages you to breathe through your nose. The elastic strap goes around your jaw and the back of your head which helps to keep your mouth shut at all times during your sleep. It is an easy to use and comfortable device that fits all due to the adjustable elastic strap. It is also machine washable and very easy to store.